Can I have that slice, yum! Kelly this is gorgeous, anyone would be honored to eat this cheesecake. I use stevia all the time thank you for this wonderful recipe! Ok this cheesecake is just great! What a picture-perfect piece of cheesecake! You can definitely freeze cheesecakes, as long as they don’t have a topping on them. Cool the cheesecake completely. You can chill it first as well, but you don’t need to. Place the cooled cheesecake on a foil lined baking sheet or leave it on its springform base and freeze for one hour, or until firm. 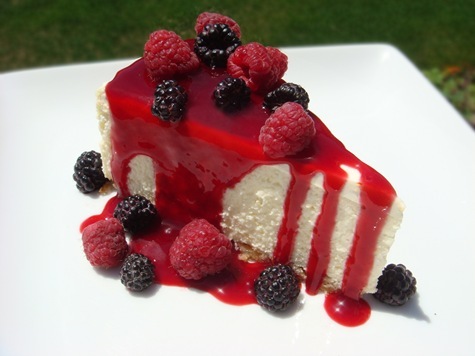 Remove cheesecake from base and wrap the firm cheesecake with plastic wrap and then tightly in aluminum foil. Return to the freezer. It should last about 30 days in the freezer if well wrapped. Thaw the cheesecake, wrapped, in the refrigerator overnight. this is great. I added some fresh lemon zest to the topping–my family ate it up while celebrating my sisters birthday! I’m glad you liked it. Happy birthday to your sister!